MALOLOS — Kiefer Ravena and Bright Akhuetie took command to lead Mighty Sports to a 79-67 win over Jumbo Plastic Linoleum in Game One of the PCBL Chairman’s Cup finals at the Malolos Sports and Convention Center. Ravena finished with 20 points while Akhuetie had a double-double of 18 points and 19 rebounds as Mighty Sports took a 1-0 lead in the best-of-three series. Mighty Sports can wrap up a maiden league championship in Game Two on Wednesday night at the Marikina Sports and Convention Center. “Hats off to the players. They followed the game plan. Ang nakakatuwa pa ‘yung extra effort nila. Duma-dive sa mga loose balls and we capitalized on their turnovers,” said Mighty Sports coach Mike Fermin. Mighty Sports played Game One without Kevin Ferrer, who is in Bangkok with the Gilas cadets side competing in the 2016 Seaba Stankovic Cup. That didn't stop Mighty from dominating. Akhuetie scored nine points in the first quarter when Mighty Sports opened a 20-12 lead. Ravena also set the tone in the second half, making 15 markers to keep the Giants at bay. 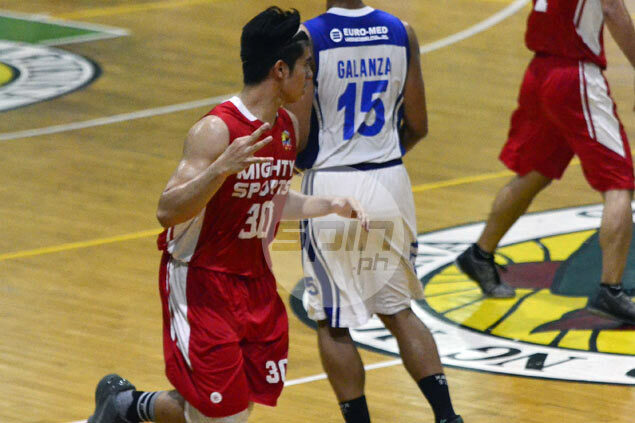 Jeff Viernes had 16 points for Jumbo Plastic, which had 19 turnovers that led to 18 points for Mighty Sports. Jaymo Eguilos chipped in 11 for the Giants. Mighty Sports (79) — Ravena 20, Akhuetie 18, Banal 10, Mangahas 6, M. Bringas 6, Regalado 6, Montilla 4, Celada 4, Lopez 3, A. Bringas 2, Wongchuking 0. Jumbo Plastic (67) — Viernes 16, Eguilos 11, Martinez 9, Arellano 7, Arafat 6, Lopez 5, Santos 4, Siruma 4, Ibay 3, Taganas 2, Perez 0, Bitoon 0. Quarters: 20-12, 34-25, 56-48, 79-67.